Monster Hunter 4 arrives in Japan on 14th September, which is just over two weeks from now. There are franchise fans in PAL regions and North America that would, we suspect, offer up all-manner of sacrifices for the same deal. As it is, there's been no word on localisation, with Capcom's most recent statements declaring that the title is set to remain a 3DS exclusive in the near future a positive from Nintendo's perspective, and if sales go through the roof in Japan we'll hopefully see the title come West eventually. Is 2014 too much to ask? In any case, it's looked like an impressive entry in the series in recent months, with new reveals doing much to encourage hope. Capcom has now unleashed the opening cinematic on the world, a CG affair that typically sets the tone for the kinds of monsters that will be prominent in each entry. We see the new Insect Staff in action, as well as the Felyne partners doing their best to help, while the rather scary Goa Magara makes a dramatic appearance. Big monsters, action and epic music are all present and correct. Check it out below and, if you live in Japan, please don't gloat too much. If this game doesn't come to the West, I will never forgive Capcom. . .
@cbkummer we should do that physical mail thing. you know. the one fans did to nintendo to force them to localize xenoblade and other jrpg's ... if ever that happens. I really want this on Wii U!!! Wii U & NA CMON CAPCOM!!!!!!!! So I guess this means Animal Crossing: New Leaf won't hit 4 million in Japan? Not interested unless it comes to Wii U in North America. @cbkummer Capcom has been telling us to beg, slapped us in the faces and and alienated the west to such degrees recently, I wouldn't be surprised if they said "there's no interest". Even if about 15 petitions with tens of thousands signatures say differently. But true, I'd never forgive them, like I already have an entire list of unforgivable stuff they did or are currently (not) planning to do. Sigh, wish I could buy it first day, but no monies. That's it, I'm moving to Japan. The game could probably look just like that on Xbox One or PS4 (minus the slightly garish colors). Oh its coming west or there will be a mob on Capcoms front door and we will storm the castle! Why we're at it we will make them produce a proper Resident Evil and tell them less action is more! Well obviously it will come to the west... they don't bring out Monster Hunter Tri, and then another for the 3DS and Wii U, just to skip the next one after having created new fanbases in the west that grow. Why worry, it's a slam dunk. @Kirk Yeah exactly, it would fit right in with all the other games that play like movies. Talk about improvement. YES! YES! YES! Please Nintendo, localise it, come on. I have a feeling it'll be worth your while, what with the huge 3DS install base in the west now! Localization will depend on how well MH3U sold. I bought 2 3DS copies and a WiiU copy. I did my part. I'll wait for the reviews. Bought MH3 for the 3ds and still haven't opened the plastic, whats the point when MH4 is around the corner, tailored to the 3ds? Great trailer! If my only option is 3DS, then so be it. I really hope there will be a Wii U version though. Except that didn't affect Nintendo of America's decision. Only reason Xenoblade was brought over was because GAMESTOP saw a profit opportunity after seeing the Operation Rainfall movement. The Last Story and Pandora's Tower were both published by XSEED, a publisher that's used to bringing niche titles over and are more likely to appeal to JRPG fans than Nintendo of America ever will, especially if it's profitable for them. Nintendo had no intention to ever bring these titles over themselves and obviously had no faith in the performance of JRPGs in America. It's why Fire Emblem Awakening was so hard to find at launch; NoA underestimated the demand for the game. I'm still surprised that X and SMT x FE are announced for America, but I would not be surprised if NoA decides to cancel the release of those games later on or delay their release to one or two years after the European release. 8/10 in terms of epicness. Hm...less detailed hair, slightly weaker lighting. Textures and models MIGHT be similar. XBone and PS4 are nice, but I wouldn't count on them reaching CG levels just yet. We've gotten almost every game in the series, so I'm sure we'll get this one too. Japan has had MH3U since December 2011 where as we've only had it since March of 2013, thats probably why theres no localization announced yet. Its still way too early to announce a sequel for the west. Wow, I like how Goa Magara took down Tigrex like it was nothing. That things certainly going to be fun to fight. I honestly don't know why this game takes so long to localize. There's hardly any text other than the names and descriptions of the items and the monsters. if the game looks(and plays) as fine and smooth as this "opening" the 3DS' hardware will fry from excessive awesomeness!!!!!! I wish the west would get it this winter. I would buy a 3ds just to play this game to tie me over till it hits the WiiU. I wouldn't if it's close to summer though. It will consume my life. Need more MH games Capcom. @GrinderFiend With that logic, why'd you buy it in the first place? Anyone else notice that the guy waits until the other hunter is off before he shoots it but he goes ahead while the cats are still there? This will come to NA. Monster Hunter is such a system-seller they'd be crazy not to localize this. @zionich agreed both my brother got it on the 3ds and Wii u. We started playing this again the other day and forgot how great it is. I am very confident that Capcom will bring this to the west and if they don't they can expect a huge loss in profit as well as a bunch of pissed off fans (me included). The more they show this game off without any hint of a western release the more I find myself not caring anymore. I just had to pick my jaw up off the floor. 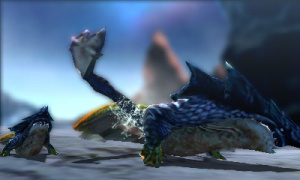 I'm playing MH3U on my gamepad atm and just drooling over that cinematic. Wow. Must find a way to import a 3DS LL and that game... come on money! @dumedum Right, it's just that need most of us have for official confirmation. Then, it'll just be a matter of "when." We know we're gonna wait a rough year for a Western release if they haven't even announced it, but it'd be pretty rad to see it come out exactly (or close enough to) one year after 3 Ultimate's release here.